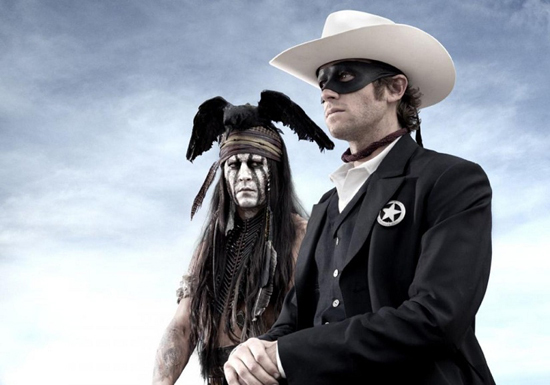 First Look: Johnny Depp & Armie Hammer in Walt Disney's 'THE LONE RANGER'! Producer Jerry Bruckheimer has debuted our first look at Johnny Depp & Armie Hammer in Walt Disneys' The Lone Ranger. Hammer portrays the Ranger & Depp plays Tonto. Ruth Wilson, William Fichtner, Helena Bonham Carter, James Badge Dale, Barry Pepper, Tom Wilkinson & James Frain all co-star. Directed by Gore Verbinski the movie marks the director & Depp’s fifth collaboration after the first three Pirates of the Caribbean movies & Rango. The Lone Ranger is described as "a thrilling adventure infused with action and humor, in which the famed masked hero is brought to life through new eyes." The Lone Ranger hits theaters May 31st, 2013. I'm reading: First Look: Johnny Depp & Armie Hammer in Walt Disney's 'THE LONE RANGER'!Tweet this!